How can we identify crop types with remote sensing? But how can we identify different crops with remote sensing? 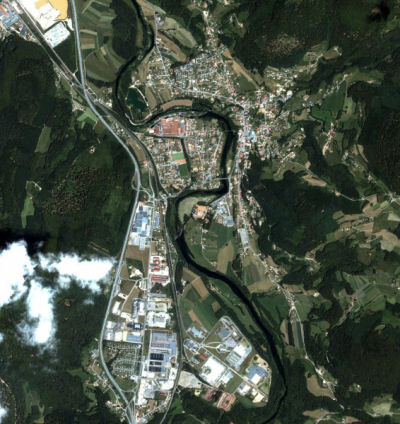 Here is an example: Simply by looking at the satellite image below, we can make some distinctions between the crops grown in different fields. Even though vegetation is green in general, different species have variable "shades" of green. These "shades" also change as the plants grow, mature and wilt. The different shades of green are not easy to distinguish with the naked eye though. The two images below show a part of the original big image. 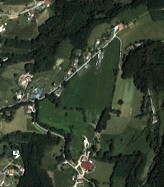 Can you find where this area is on the original image? The small image on the left is how the naked eye would see it (and it is called	true colour). The one on the right shows what it would look like if we could see in the infra-red (called a false colour image). The true colour image appears to have a uniform green colour. However, when we look at the false colour image we can see that the field shown in the central part of the image is actually separated in two sections that have a different shade of red in the second image. The reason why the two sections of the field look different is because they have different near infrared reflectance. Vegetation in general has low reflectance in the visible region (what we see with our eyes), and only a small amount of green energy is not absorbed. On the other hand, it has much higher reflectance in the near infrared. 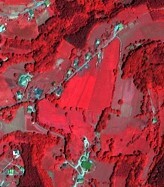 See how vegetation reflects the visible and near-infrared radiation. Different plants reflect the near infrared energy in a different manner. Even if they look similar to the naked eye, we can use this characteristic to identifying different crops.